The sea of mourners at the recent funeral of a ­Lashkar-e-Toiba militant killed by security forces in Anantnag of south Kashmir reemphasised what we have already known, but refuse to ­readily acknowledge: an ever-deepening divide that separates the people of the otherwise picturesque region from the rest of the country, including the rulers in Delhi. The turnout at the funeral was also proof that with every ‘success’ registered by the security forces, we are not ­getting any closer to a resounding victory. If anything, these ‘successes’ help in feeding local ­grievances and losing more ‘hearts and minds’. Lives are being lost without any tangible gains. Kashmiris are bearing the brunt of the turmoil, but even India is bleeding, with casualties on both sides, including soldiers made to make the ultimate sacrifice. This utter hopelessness and cycle of violence have been allowed to fester for far too long. Indeed, few disputes in the world have defied a solution for this long. North and South Korea have been at daggers drawn for decades, but following a summit between Kim Jong-un of the reclusive Pyongyang regime and US President Donald Trump, a thaw looks imminent. In between, disputes such as the ones in Northern Ireland and Bosnia have been thrashed out. Kashmir, unfortunately, is one of the two long-running disagreements stubbornly refusing a solution. The other is Gaza, at the heart of what seems to be an intractable standoff between Palestinians and Israelis. Stalemates are energy-sapping and self-defeating, so it would surely serve all of us well if an agreeable solution to Kashmir is arrived at the soonest. It is easier said than done, but what’s the harm in at least trying? If India is to prosper as a truly democratic nation, it cannot allow a sizeable section of its citizens—the Kashmiris—to live in perpetual disenchantment and despair. A breakthrough is the need of the hour. But what is more urgently needed is a concerted and conscious bid to move away from oft-repeated phrases such as ‘Kashmiriyat’ and ‘healing touch’, and arrive at some concrete measures. The delusional clichés of the past have failed to deliver and we find ourselves trapped in a situation where positions have only hardened on either side. The last remnants of goodwill have seemingly dissipated and ­been replaced by hate in both public discourse and prime-time TV. There are many among us who see any word of ­sympathy for the Kashmiris as an act of treachery and betrayal. There is distrust and suspicion on the other side too, with many hot-heads amid their ranks. It is, therefore, time for a new initiative, a new narrative and new idioms to break the logjam, infuse hope among a populace who feel they have none, and allow a well-meaning government to seize the initiative. Arriving at a common ground and a consensus is a minefield with divergent views and diverse actors involved: ranging from Muslim Kashmiris and Kashmiri Pandits, to non-state actors and our bete noire Pakistan. Every roadmap must necessarily begin with brainstorming and Outlook for one made the effort to gather people in a quiet Delhi hotel for an honest discussion. The panelists were drawn from diverse sections—the RSS, the National Conference, the PDP, the Hurriyat, the army and also thinkers from Kashmir who have a lot at stake in the way things pan out in the Valley. 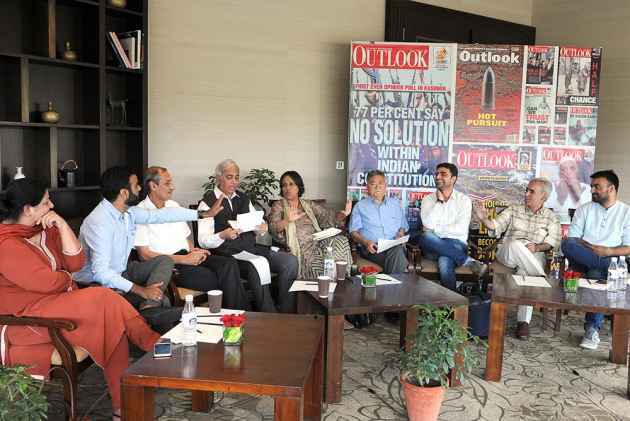 The Kashmir Roundtable we hosted was necessarily rich and partly rhetorical. But amid the din and disagreements, there were also suggestions that bore the early signs of what could someday emerge as a meeting point. Dialogue, we believe, is a must to solve a puzzle that many see mostly in terms of geopolitics and strategic affairs. For me though, it is a humanitarian tragedy that is at the core of the Kashmir issue, waiting for an urgent solution.